UPDATE February 19, 2014: Since I posted this almost two years ago, there has been a lot of back and forth about Intuitive Childbirth, questioning the program and the founders, including recent allegations of connections to white supremacy websites and comments. I am keeping this post here so that the comment record remains and people who search for this group can do their own research and see the record of different experiences with the program. I am not comfortable endorsing the organization at this point because of the various allegations–but I want this record to exist for future potential students so the allegations don’t disappear along with the post. I also removed the group from my list of doula training organizations. I’ve kept on updating this list of doula training organizations, and it continues to grow! Most of the training groups I know little to nothing about, and the information has come from reader emails and the training websites. The list is not an endorsement of any particular training, just a resource for those looking for training options. Occasionally though I’ll be posting guest posts about different trainings, just to give folks a little bit more info for those interested. The info below came from an email from Samantha, one of the cofounders of Intuitive Childbirth, a new doula training that is FREE. Yup, you heard that right, free. 1. Our training is free. Throughout my own journey as a doula I have encountered countless women who have the passion and desire to become a doula but lack the financial resources to do so. With the high fees the majority of programs charge, this inability to sacrifice financially is understandable, but I was outraged that women who felt so passionately and had such a great desire to make a difference in this realm were being denied the opportunity to do so. 2. We support choice. Nearly every other organization officially supports natural, unmedicated childbirth, interventions only when necessary. Although I am in full support of natural birth, I think it is important for doulas and women to recognize that this may not be the right choice for every woman and every birth. The only “wrong” decisions in birth are those made in ignorance, or against the mother’s desires. Every woman deserves the support of a doula, no matter what her desires for her birth are, and by officially supporting natural birth only, we are closing off a very large demographic of women to the incredible amount of support a doula can provide. We support choice. We believe that every woman intuitively knows what decisions are best for her. it is her doula’s job to help educate, inform, guide and support her as she discovers for herself what those decisions are. 3. We support the autonomy of a doula in her practice. Many organizations place restrictions on how a doula can and cannot practice. Some organizations forbid the use of essential oils or accupressure. Some forbid doulas from attending unassisted births. These restrictions are unfair to the doula as she should be able to practice as she sees fit. Again, it all comes down to choice. If the mother has made an informed decision on using essential oils in labor, I see no reason as to why her doula should be forbidden from assisting and supporting her in that choice. If a woman has chosen an unassisted birth, but desires a doula and is aware that a doula cannot act in the capacity of a midwife, I see no reason why she should be denied the presence and support of one. 4. We require our doulas to pay it forward. Our doulas are required to offer their services free of charge to a woman in need once per year in order to obtain and maintain their certification through Intuitive Childbirth. Just as we want to provide every woman who has the desire to become a doula the opportunity, we also want to help ensure that every woman who desires a doula at her birth has the opportunity to obtain one, regardless of financial limitations. It may only be one birth each year, from each doula, but for that woman that year, it can make a world of difference. And that is what we are all about. Changing the world, one doula at a time. Interested in learning more? Check out their website. This is a wonderful spotlight! Thanks for sharing! I sent this to your facebook too, but thought this might be better: Hey, I know you don’t officially endorse any of the trainings you are sending out, but I wanted to give you a heads up about the Intuitive Childbirth thing. I found a couple pages on the ripoff reports website talking about scammy or suspicious websites run by the same person. What sketches me out more, though, is that when I searched for “samantha van vleet doula” I couldn’t find anything about her actually being a doula…like no doula site or way to contact her about services or anything, even from the past. Just thought I’d pass it on. Thanks for being awesome! Hi, Thanks for that information. I’m going to contact the person from Intuitive Childbirth who emailed me about the training and ask her to respond. You’re right that I don’t endorse specific trainings, but I definitely don’t want to spread spam or other dishonest programs. I am currently enrolled in the program. It is not a scam. Instead, it is a fabulous organization with a fabulous mission. I love being able to work at my own pace. Samantha has been more than helpful with information, answering questions, and the overall navigation of training. We are even creating a great community of the doulas currently certifying all over the globe. The only cost is a $25 certification fee and if you would like to purchase a reasonably priced extension to allow you more time to complete your requirements. I truly believe in the organization and their philosophy. I am so proud and honored to get to be a part of it. Intuitive Childbirth. NOT a scam. I also am currently enrolled with the Birth Doula course. I won the lottery for this course and was SO impressed with the lay out that I went ahead and enrolled, out of my own pocket, for the postpartum doula course AND the placenta encapsulation specialist course! ALSO… I personally know the co-founder and have worked with her on another project a few years ago. I also know people who know her….to include a friend of mine who went to school with this co-founder. SHE IS A REAL PERSON! I’m honored to be a part of something so brilliant! I am the founder of Intuitive Childbirth, and while the ripoffreport might be concerning, I can assure you it is not a scam. Unfortunately, I had an altercation with a personal friend that escalated to the point courts were involved. She had made the report in an attempt to defame and slander me, none of the contents being true. It was a personal attack on my character and my professional endeavors. As for not having a site, I did start one, but never finished it, due to the majority of my clients being referred by word of mouth. I also had a year long ordeal with some very serious, near-fatal health issues with my youngest, so my priorities were elsewhere. I’d be happy to provide the contact information of many of our students (with their consent, of course) if you’d like to speak to someone who has experience with our organization. It upsets and hurts me to see these kind of statements, knowing they are untrue. I created Intuitive Childbirth because I saw a broken system that I believed desperately needed change. It is something I am very passionate about this and it is something I truly and wholly believe in. I am currently enrolled in a few of Intuitive Childbirths courses. There is nothing sketchy about the program. They are all distance learning, which works great for many people. The cost is almost free, yes! This allows SO many women to pursue their dreams that could not afford several hundred for a more traditional workshop that we are used to hearing about. The material provided is excellent and very informative. I am a certified through another organization for birth and have have taken CBE through another organization as well… so yes, I am comparing IC to others. And it is great. Actually, better support then I got from the organization I took my CBE through. Intuitive Chikdbirth is an amazing program. I’ve wanted to be a doula for a long time but financially I could never afford the other programs out there, with Intuitive Childbirth I have the opportunity to fulfill my dreams of being a doula. Also, Samantha Van Vleet is a wonderful instructor who, is very knowledgable in what she’s teaching and a very kind hearted person who saw I need and fulfilled it by providing the program! I am currently enrolled in the Intuitive Childbirth course, you can tell it’s a new course being that it is still being updated and worked on. But other than all of the expected things that go along with a newly developed course it is well developed and Samantha has been very, very helpful. I did ask about her certification when I enrolled and I sent an e-mail to Childbirth International to verify the information just to be on the safe side. (I tend to be a little bit overly cautious :P) It has been a wonderful experience. Both Samantha and the other students have been incredible helpful and supportive! I would definitely recommend this course to anyone, just based on my experience. I also love that 98% of my class mates are there due to a lottery selection. So much work has gone into building this course and I love that everyone has a fair shot. Also Radical Doula I LOVE your page! I found it to be very informative and inspiring when it came to my decision to become a doula! Thanks for your reply. Like TheLittleIrishDoula, I try to be very cautious about these kinds of things, as I was scammed out of a $700 deposit by a scam wedding “caterer” who even came to our house for a tasting and had lots of positive reviews by fake customers on his yelp. You’re right, Jessica, that one negative review doesn’t mean something is bad, but multiple positive reviews don’t mean something is good, either, and when I see multiple negative reviews, it makes me nervous. I’m glad this seems to check out, though, because the idea is great! I’m somewhat scared to post my negative experience with IC here, even though it may be helpful and has helped several new doulas make the choice to use another program. Opinions of IC that are not glowing will be bombarded with angry IC students, some were even telling me that I must not be a good doula because of my experience. Whenever there is a negative opinion posted about this program, the director, Samantha, posts a link to it on the IC facebook group and encourages all her students to act as an army to “call out” those with dissenting opinions. This also occurs when the director reads an answer she does not approve of on people’s private homework–it is posted (albeit without their name) publicly on the facebook group, encouraging criticism. I know that some people LOVE this program, whether it’s because they are new to the doula profession or maybe just insanely happy to find such a low cost option, and that is fine. However, I don’t think it’s fine for the attacking and censorship that goes on when someone does not write a glowing review. If you are ok with a curriculum that does not contain any references to current evidence or citations on where information and data is being compiled from, this may be fine with you, but I know some doulas want to be up to date with accurate information at the ready for clients who need it. So, I guess it’s really whatever you want to do, knowing that it’s a stepping stone to more education. 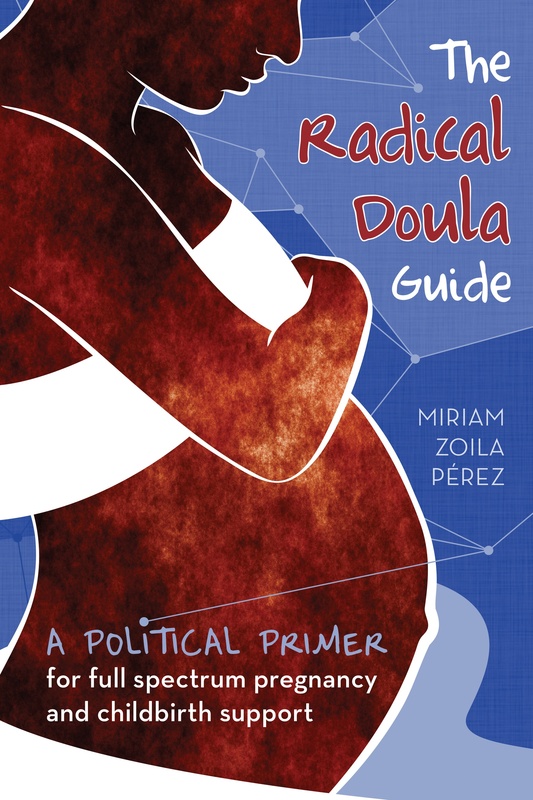 What I can say publicly, however, as it’s part of their public policy, is that Radical Doula should not be promoting this program, as Radical Doula is a staunchly pro-choice, pro-feminist, pro-LGBTQI organization and blog, with any doulas listed following suit. Don’t get me wrong, I LOVE LOVE LOVE Radical Doula and it was the premise on which I started a local Full Spectrum organization. But Intuitive Childbirth requires that all their doulas do NOT professionally take a stance on anything, especially things that are considered “controversial” such as taking a side in the abortion debate or supporting gay marriage for expectant couples. These doulas would not qualify to be listed with RD, sadly. Read over their policies carefully and make sure you are okay with not being public about your Full Spectrum services and that you are fine with having to take on any client who wants to hire you if you’re available, regardless of whether or not you ethically agree with their lifestyle choices, parenting decisions or medical decisions for themselves and baby. If it’s not illegal, according to IC, you cannot reject a client over it. I think I should post this and just not come back to this thread. I know I will soon be receiving attacks, criticisms and hatred from current students sent here by the director. Which should say something regarding ethics, but you be the judge. Well, I wasn’t “sent here”. But I am not sure where it says you cannot reject a client. You can choose whatever clients YOU wish. No one can make you take a client. While we are to maintain a neutral stance on things as a doula, that is not specific to IC. DONA and CAPPA (and many others too I am sure) require their doulas to not bring their own beliefs and views into things. I’m sorry you had a negative experience with IC. I think you have gotten some things lost in translation. I know for a fact, that the founder has never personally posted anything to ” send an army of students”. What usually happens is that a student who has seen a post, posts about it in the student group, and those who wish to defend IC, do so of their own accord. There are always hot button topics that come up, where people wonder if they could work with a particular family because of personal beliefs. Samantha has NEVER said an IC student MUST work with a client. What she has said is that an IC student/ graduate must remain neutral, provide support and education. If your personal beliefs would make it hard to work with a certain client, refer them on. Never has there been a time when IC has advocated for working with every family who contacts you. Each of us who chose this work have done so because we have a passion for it. Some of us wish to specialise in LGBT families, others with Christian families or myself, I personally would like to specialise with indigenous youth. And there is nothing in the IC philosophy that prohibits or goes against that. The only thing that has ever come up is a gentle warning that a) you could limit your client base, but that’s totally the individuals call. And b) instances where a client may be turned away for her choices she makes for her baby AFTER the baby is born. I have years of experience as a doula, but I decided to get that little piece of paper that sometimes puts people’s minds at ease. I looked at many schools, IC is the only one I found fit with me because of it’s philosophies. One of them being that IC doulas/ students do not judge or force their own agenda. As an IC doula my job is to inform, educate and support. Whether that means I support a mother who chooses an epidural, supporting a woman who chooses to terminate her pregnancy, supporting a LGBT couple welcome their new family. It doesn’t matter what the situation, my job boils down to support. If however I personally couldn’t support a woman who chooses termination, then my job would still be to support that woman without judgement, but to have an open honest dialogue with her, tell her that I personally do not work with these situations, but I can refer you to either a doula friend or organisation that can support her. Yes I am grateful that IC offers such a comprehensive course at very little cost. But I could have kept on going doing what I have for years, without a piece of paper that says I’ve finished a course. I’m very proud to be associated with IC, I’ve seen many other doulas who have gone through supposed reputable schools, and wished there was a governing body I could report them to. Just because IC is only just beginning, does not make it a bad school. The course material is very comprehensive. And as I said, I’ve done this work for years. The BD course definitely sets up a doula with a powerful knowledge to start out. As for personal attacks on Samantha, well really? Is it needed? When she has shared someone’s view or question to the group, she does not show names for a start. And typically if she shares something it is either because its a further chance to educate, or a question that has come up a lot so that it can be addressed to the group at large rather than many individual times. Again I must make this VERY clear. At no time has Samantha ever stated that an IC doula must take on every client who wants her services. IC students have the discretion to make a good match with clients just like any other doula. If personal beliefs, personality clash etc are present. An IC doula is in no way under any obligation to take on that client. If however an IC doula refuses services because of prejudice, decisions that the family makes after the baby is born, when otherwise client and doula were comfortable with one another and were a good match. That does go against IC philosophy of support. I signed up w/ IC thinking it was a great idea. But once I started reading through the course materials I saw it was lacking in citing research to back the information. In doing some digging I could not find any mention of any credentials or qualifications of the owner and creator of the courses in anything related to the fields of which her company certifies people. I’m not big on papers and titles, but if you are selling certifications in the field of lactation consulting, doula work and childbirth education shouldn’t you at least have an extensive history yourself in these fields? I too feel the need to share my disdain for IC. Radical doula, I’d suggest removing this post from your page because intuitive childbirth was not even legally licensed as a company until yesterday. I’m a student and have had zero of my concerns addressed. There is no accountability or sense of organization. When someone needs something, suddenly Sam is unavailable or on a trip or whatever. Then her creepy husband comes in and gives you a vague response to what you need. Intuitive childbirth is SHADY. Intuitive Childbirth is advertised as a complete birth professional training program. This is false advertising. The course content for birth doulas is sorely lacking. The course content for postpartum doulas is even worse. The course content for the lactation and childbirth education courses were written in a WEEK. Placenta encapsulation course, pfft. They are worse than the first two. None of the these programs prepare a birth professional to go out into the world and begin practice. They are glorified outlines at best. Individuals with no prior training or experience tend to be pleased with the program. Those that have trained or certified elsewhere find that the materials are lacking and concerning! Think this needs to be info put out here since this is about Full Spectrum work. Samanthavv is the screen name of Samantha VanVleet, the owner and creator of Intuitive Childbirth. Storm Front is a well known white supremacist/Neo-Nazi organization. She is posting about how she makes beautiful Aryan children and how to encourage white people to have more children. Mods, PLEASE reconsider having this organization in the spotlight since the curriculum is based solely off the work of one person. Safe to say I don’t think Radical Doula promotes white supremacy. The post has since been removed. When I went to go look, it was gone. I recently saw a screen shot of the very page they were talking about, it’s all there just as described. Not sure how to get that screen shot to you but I’ve been shocked by this “company.” Can’t believe I fell for it. Very untimely, very shady & no credentials. UPDATE February 19, 2014: Since I posted this almost two years ago, there has been a lot of back and forth about Intuitive Childbirth, questioning the program and the founders, including recent allegations of connections to white supremacy websites and comments. I am keeping this post here so that the comment record remains and people who search for this group can do their own research and see the record of different experiences with the program. I am not comfortable endorsing the organization at this point because of the various allegations–but I want this record to exist for future potential students so the allegations don’t disappear along with the post. I was curious about the above post involving Samantha’s involvement in white supremacy groups so I searched that username and her location. That brought me to her profile on Mothering.com ( http://www.mothering.com/community/u/126820/samanthavv ) From there I found her admitting to being the woman who runs Intuitive Birth on this thread (http://www.mothering.com/community/t/1393793/anyone-familiar-with-intuitive-childbirth-for-doula-certification). This made me rather certain that the woman on the Stormfront thread was indeed the owner of IC. I just withdrew from IC. I have personally reported them to the BBB, Dept of Licensing ( they were accepting tuition, and running an education program without a business license until Feb 2014), and the internet crimes division ( working with the FBI) is now also looking into the business. The program sounds fantastic, but a lottery spot isn’t worth much when you realize what you are tying your name and practice to. I was almost done with certification, but opted to withdraw. It is not worth being tied to these people, their illegal business, or their ignorant views. So glad there’s no more informal endorsement. I am yet another duped student who sincerely hopes that no one else ever gives this crazy woman another cent. Practice as uncertified, save your money until you can afford a real program. This was just a sad waste of time. Even if I felt like my training had been great, I would not want to be associated with someone like this. If I certified with IC and told clients that they could easily do a search to find out more about the program/director and it would not reflect well. I was thrilled for IC, I signed up wrote my little essays and within a few days was told I won a course to be a “Child birth educator”, I cannot afford schooling to be this aside the little amount that IC charged, 50$ what a steal right? Yeah, except its not legit at all. The course material is a joke, and anyone who has even looked at it will know that. That all aside IC was not legit in any way, I was told about white supremacy regarding Samantha but not only that, IC not being certified until 2/14 which is pretty late considering when it began to be a “course”….so I messaged sam asking for a refunding stating my issues with IC, she responded the very next day stating i signed a contract and that was that, however i paid and signed 2/4 – 10 days prior to it even being legal…and therefore it is null and void- I responded asking her for her certification and date and all the legal information that would clarify it for me, she never replied back- a couple weeks later i messaged her again stating how unprofessional this was, keep in mind i was in no way rude to this women and all i am asking is for my money back. I am currently in a dispute with paypal to receive my money back from this woman, I HIGHLY ENCOURAGE YOU TO LOOK INTO IC BEFORE YOU THINK ABOUT THIS. Dont do it. Go through DONA, thats what I am going to do next. Sadly this was to good to be true. I’m nearing the end of my training as a doula, post-partum doula and child birth educator. I have been very pleased with all of my training. I attended my first birth as a doula a few weeks ago and my client did so well that the attending nurse and midwife said they had not seen a laboring mother with such control in years. I did a Google search on Sam and found nothing objectionable. So far I have no bad experiences with the organization and believe its mission to make doula training accessible to women quite laudable. Noelle congrats on the first doula experience! It’s always beautiful. As for the information via google on Sam it’s all been taken down, that’s why you cannot find it. I suggest you ask for the legal information regarding her liscensing and certification- that is what matters at this point. She has ignored me to this day on this, which is incredibly important if you want to be certified! I’m near the end of a claim with pay pal and b of a to receive my money back. I wish icb was what it states it is. Let me know if you get any information please. Thanks!